A horse becomes lame when there is a source of pain in one of its legs during locomotion, leading to an unwillingness of the horse to fully use that leg. Lameness is first noticed when the gait becomes uneven. In the case of forelimb lameness, the horse will be seen to nod its head. Typically the horse will put more weight on the opposite, unaffected limb during exercise, therefore it is said that the horse lowers his head when the good leg hits the ground and raises his head when the painful leg contacts the ground. When the horse is lame behind, the same principle applies and the hips of the horse are seen to move unevenly. When the movement of the hips is examined closely while the horse is trotted it is possible to detect the affected hindlimb. A diagnosis of the cause of lameness is often not straightforward. Initial examination of the leg by your veterinary surgeon will involve detection of any obvious areas of heat or swelling. A foot examination will also be performed given that the majority of lameness cases involve structures within the foot. Subsequent investigation may involve nerve blocks which aim to narrow down the area of pain using local anaesthetic. Additional diagnostic techniques may also be required including radiographs (X-rays), nuclear scintigraphy and CT or MRI. It is important to recognise that not all horses move in exactly the same way and that these differences may not necessarily be classed as lameness. Ideally, a horse will move its limbs in a completely straight line and the hind limbs in a separate plane to the forelimbs. Some horses’ movement deviates from this ideal and these deviations are known as gait abnormalities.At the early stages of a chronic lameness it may be difficult to distinguish between an abnormal gait and a lame horse but your veterinary surgeon will be best placed to offer advice and the best course of action. This is a condition where, during walk, the horse suddenly over flexes one or both of the hindlimbs, commonly described as the horse ‘snatching’ up one of its hindlegs. It is most obvious at the walk but may be present to a lesser extent or completely absent at other paces. There is no known cause for the condition and a surgical correction is sometimes suggested. However, most horses compete without problems, although they are not suitable for dressage. There are numerous conditions which may cause pain and therefore lameness in the forelimb of the horse. These may vary according to breed, conformation, the type and intensity of activity as well as the surface upon which they are worked. However, there are some common conditions which are seen on a more regular basis than others and these are outlined below. Signs of bucked shins include warm, painful swelling over the areas affected. This condition occurs more commonly in young horses than older ones. The distal (furthest from the body) part of the suspensory ligament runs down the back of the fetlock from the carpus (knee) to the coffin joint. It is an important support structure preventing over-extension of the fetlock. The condition is caused by either a sprain or rupture of the ligament leading to inflammation. 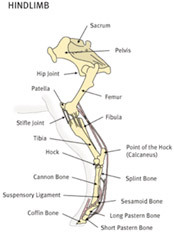 The damage occurs when the fetlock is hyper-extended and stretched down towards the ground. Hyper-extension of the fetlock occurs during galloping or when working in soft-going, like mud or deep sand. It is a common injury in both Standardbred trotters and Thoroughbreds whilst the other nearby support tendons can also be injured at the same time (flexor tendons and check ligament). Signs of the condition are a significant lameness which can lead to chronic unsoundness sometimes permanent. The splint bones (2nd and 4th metacarpal bones) are the small bones that lay on either side of the 3rd metacarpal (cannon) bone. The second metacarpal is on the inner (medial) aspect of the limb and the 4th metacarpal is on the outer (lateral) aspect. 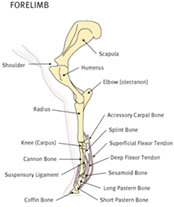 This condition most often affects young horses and the inside splint bone is more commonly affected. The cause of splint problems is generally due to mechanical trauma and concussion, for instance working on hard surfaces, and poor conformation (e.g. offset knees). Strenuous training, as well as accidents occurring during rough play at pasture (e.g. jumping), can be responsible. The condition is not due to damage to the bones themselves but to the ligament that knits the splint bones to the cannon bone. This damage results in inflammation of the ligaments and incites new bone formation associated with periostitis. This process manifests itself as swelling and pain over the affected splint bone which causes lameness in that limb. Tendon damage is caused by overextension of the lower part of the leg. The flexor (deep and superficial) tendons lie along the back aspect of the cannon bone and provide the majority of support to this region. Tendons have fantastic elastic properties and are designed to recycle much of the energy the horse expends during exercise. Just like a rubber band, however, they have their limits and overextension can cause serious damage. Damage to the tendons is characterised by severe inflammation of the tendon, seen as heat and swelling of the affected area. First aid treatment involves minimising the inflammation by cold hosing and the application of ice packs to the area. Your veterinary surgeon will also advise on the administration of anti-inflammatory therapy and appropriate shoeing techniques e.g. wedges. A new technique has recently become available for the treatment of certain tendon injuries. This involves harvesting stem cells from the horse’s bone marrow, growing the cells in the laboratory until there are sufficient numbers to be injected into the defect in the tendon. These stem cells then become tendon cells and help to fill in the defect with tendionous tissue, rather than scar tissue which is often much weaker. Early results are very encouraging and, with appropriate aftercare and rehabilitation, many horses will return to their former athletic function. Inflammation due to strain injury results in a distortion of the normal arrangement of collagen fibres within the tendon and in a deposition of scar tissue. These factors contribute to damaged tendons developing a bowed appearance. The extent of the changes may be subtle and, although the fact that the tendon is bowed does not itself predispose the horse to further injury, the sheer fact that the tendon has been injured previously means that the horse is at an increased risk of sustaining further damage. Recent work has investigated the properties of tendon and any predisposing factors for tendon injury. Generally speaking you cannot ‘train’ the tendons to become stronger, i.e. the more exercise that is performed does not result in stronger tendons. In fact the opposite is true; tendons in fact became fatigued depending on the nature and intensity of the work that they have performed. Therefore to protect the tendons of your horse ensure that any strenuous work is performed on suitable ground. This condition is a soft swelling of the hock joint. The swelling is the result of an accumulation of fluid in the joint space. Poor hock conformation, trauma, and stressful exercise may contribute to susceptibility. The main part of the swelling is seen at the front of the joint to the inside of the limb. Sometimes two additional swellings are noted at the back on the sides of the hock joint; inside and out. Lameness does not always result, but the area may be tender at least in the initial phases. Advice should be sought from your veterinary surgeon as to whether they consider treatment to be necessary; in many cases it won’t. This is an arthritic condition of the hock. Horses with cow hocks or sickle hocks are more commonly affected, as are Standardbred horses. A bony swelling will be noted on the inside of the lower hock joint, and the horse will tend to wear the toe of the hoof. The swelling may not be apparent in the early phases and the first indication may be lameness. In spite of numerous types of medical and surgical therapy, in the worst cases this condition may result in permanent lameness. The prognosis (prediction of outcome) is always guarded and complete recovery is not always attainable but the horse may be able to perform normally to a low intensity of exercise. A period of stiffness until the animal has warmed up is to be expected. This is a condition that produces a swelling along the back of the hind leg just below the hock. It is the result of damage to a ligament that helps stabilize the hock joint. The inflammation results in new bone production around the attachment of the ligament and results in a thickened appearance. These horses are sore for a period of time until the inflammation has settled. Sickle or cow hocks (poor conformation) and trauma predispose to the disease. The prognosis is more favourable if trauma is the inciting cause than if the condition results from poor leg conformation. Treatment centres on increasing the muscle mass and strength of the hindlimbs e.g. more hill and trotting work. Usually, gentle manipulation by a veterinary surgeon will resolve the condition but, in severe cases where the condition reoccurs, it may be necessary to surgically cut the medial patellar ligament. This is a minor procedure and when the ligament heals the condition is unlikely to reoccur. 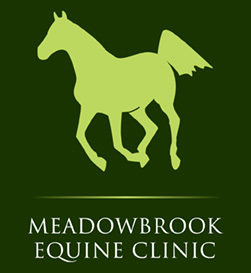 Your veterinary surgeon will discuss with you any concerns you have with your horse. Your veterinary surgeon can provide advice on investigation and treatment of hind limb lameness and should be contacted if problems are suspected. Often the prognosis for return to soundness hinges on prompt treatment. There are many more conditions that can affect the horse’s hind limb and your health care team is a solid resource for information about those other conditions.